Do you want to make your site look exactly like the way you imagined without hiring a developer? You might want to consider using the Themify Ultra theme that comes with lots of design skins and built-in demo sites to choose from. In this Themify Ultra review, we’ll show you its features and whether it is the right theme for your needs. Themify Ultra comes with 60+ pre-designed layouts and a drag and drop builder, so you can create a WordPress blog or any type of website almost instantly. With Themify Ultra, your imagination is the only limit to create a beautiful engaging website. Let’s take a look at some of its features below. Most themes require you to do lots of customization on them if you want to create a design that looks exactly like the demo site. However, Themify Ultra lets you create the demo site setup with just a single click. Once you activated the theme, you’ll be asked to choose a demo design as an optional choice. 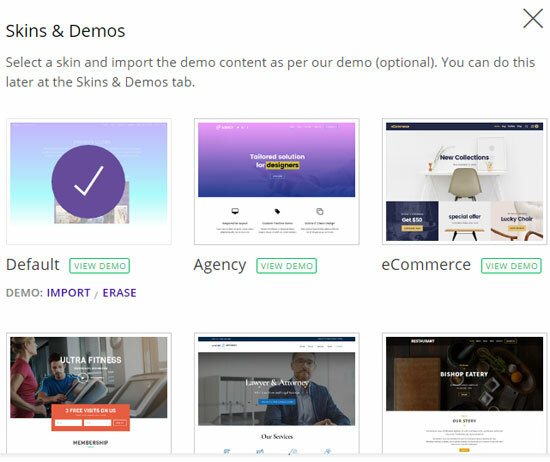 You can import the demo content with just a single click. After importing, you can edit the content to make the site look unique. Themify Ultra supports many animation effects such as parallax scrolling. Parallax scrolling helps you to move the background content at a different speed than that of foreground content when your visitors scroll down a page. 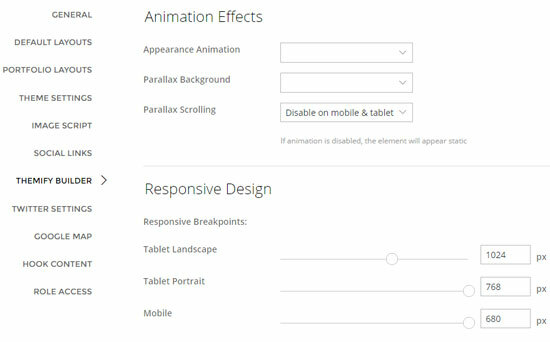 By default, parallax scrolling is disabled on mobile and tablet in order to keep your site loading fast. You can change the settings by going to Themify Ultra » Themify Settings. Then, click on Themify Builder and change the animation effects per your needs. You can also customize the responsive breakpoints on that same page. Upon the theme installation, you’ll be asked to install Themify Portfolio Post plugin. This plugin gives you the ability to add portfolios to your site as a new post type, meaning you can publish portfolio content on your site the same way you publish posts and pages. 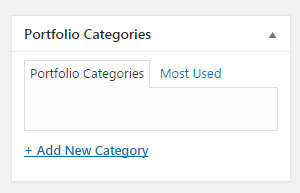 You can find the Portfolios tab in the sidebar menu on your WordPress dashboard. 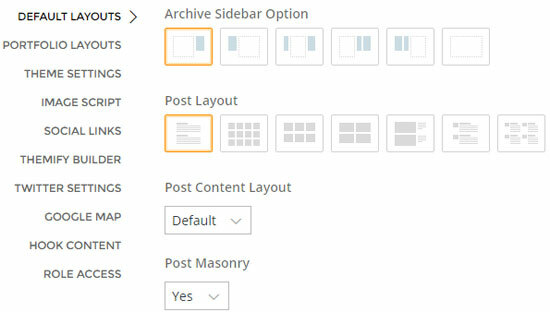 On the portfolio post editor, you can find the Portfolio Categories options, just like a typical post category option. To customize the portfolio page layouts, you can go to Themify Ultra » Themify Settings » Portfolio Layouts. Similar to post and page editors, Portfolios editor page also comes bundled with the drag and drop builder. With Themify Ultra, you can use the Hook Content option to add content to your theme without editing any template file. For instance, if you would like to add an AdSense banner on every single post, you just need to use the hook content option rather than editing the template file. Despite the small learning curve, using the hook content option is very convenient way to tweak your theme’s template. 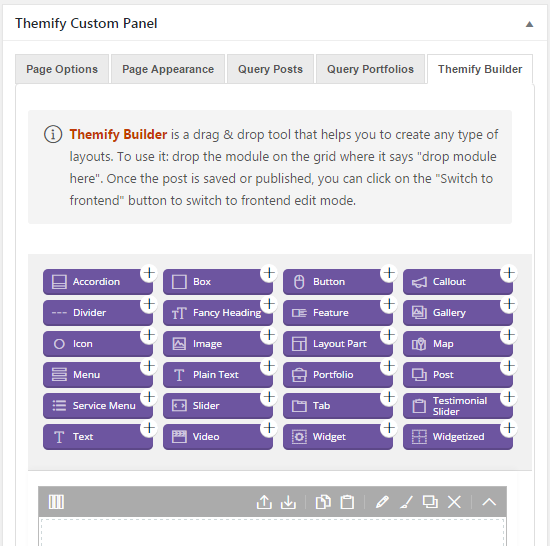 You can customize different Themify elements using the default customizer option. In the customizer option, you’ll find basic and advanced options. 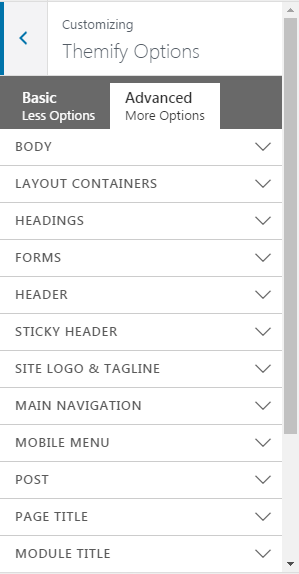 In the Advanced option, you can create forms, mobile menu panel and much more. With Themify Ultra, the opportunities to create a beautiful site are endless. Below are a couple of more features that help you to make your site’s appearance unique. Mega menu: Add recent posts, multi-column menus or even widgets into the menu. Image filters: You can filter your images without editing the original image source. Themify Ultra’s documentation walks you through the entire list of features. All of the tutorials are well explained with beautiful screenshots and videos. Themify Ultra offers support through their forums and emails. For faster support response, it is recommended you to use their forums to post questions. Themify Ultra is available for a one-time purchase fee of $49. When you make a purchase, along with the theme, you’ll also get access to 9 site builder addons like a WordPress form builder, image pro, etc. You are allowed to install the theme on as many sites you’d like. Themify Ultra gives you full control over your theme design even if you’re not a developer. With its drag and drop builder and the Hook Content feature, you can create any type of sites easily without having to hire a developer. We don’t recommend anyone. However, to hire an experienced developer, I’d go to Upwork.com, post a job and list my requirements. Understood that it is an one-time purchase fee of $49. Do we need to pay for any updates of this theme or plugins, etc. in future? Kindly let me know at the earliest. For one year, updates are free. If you’d like updates after the first year, then you might want to purchase it again for the same price. Thanks for your reply. It means every year we need to renew it. If we do not update the plugins and wordpress versions, it may create problem. Kindly let me know.